Labs in the School of Science, Engineering and Technology have received an infusion of cutting-edge technology – almost a half-million dollars’ worth – thanks to grants from two top philanthropic foundations. 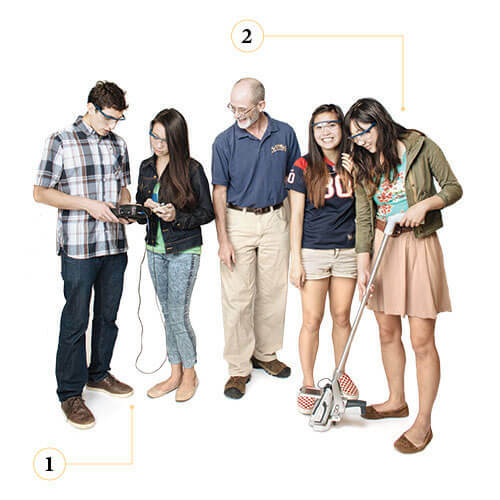 As a result, students in the departments of Engineering, and Physics and Earth Sciences are getting their hands on a bunch of cool, innovative equipment. The grants — $250,000 from the W.M. Keck Foundation and $200,000 from the Albert and Margaret Alkek Foundation — were used to purchase an array of devices, most of them so technical they are challenging to describe here. So instead of reading lots of technical jargon, take a look at our students and professors interacting with these high-tech gadgets. This new machinery not only gives St. Mary’s a competitive edge in the fast-growing world of research-based schools, they will be an educational boon for students for years to come. It’s more than just financial support from a foundation to a university; it’s a partnership that serves the public good. Some gifts really do keep on giving. Olympus Digital Ultrasonic Thickness Gauge (38DLP-X-ET-E-EN) Sonic SystemResearchers in Environmental Science use this device to measure the structural property of any rock. Niton (XL3t 500) Industrial Portable XRF Analyzer (and accessories)Not a metal detector, even if it looks likes one. 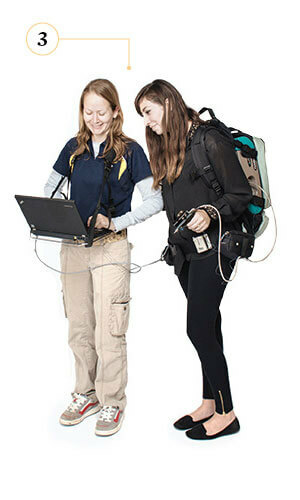 This provides compositional measurements of soil and mining samples for Environmental Science applications. ASD FieldSpec 4 Wide-res SpectroradiometerEnvironmental Science students and faculty use this handheld scanner to collect field data and map vegetation at a high speed. FESTO Warehouse MPS 500This small-scale test environment allows Industrial Engineering students to test theories on optimizing robotic assembly and transportation. 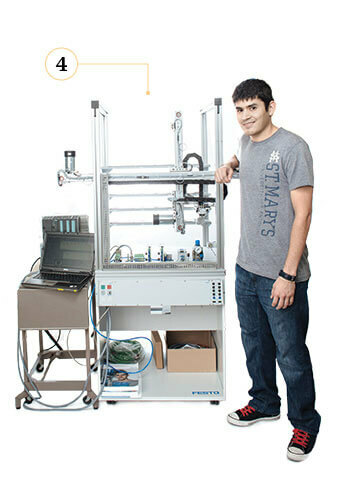 SolidWorks SoftwareGetting ideas from conception to production is where this product comes in for Engineering students. Complex software turns concepts into computer-aided renderings that can be brought to life using the next two machines. 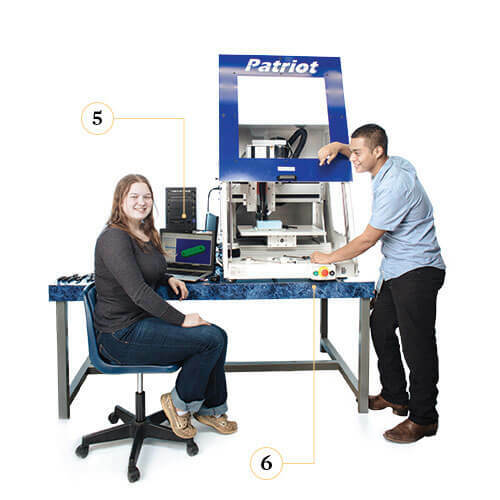 Techno Patriot CNC Production CenterEngineering ideas go from concept to reality thanks to this device that builds 3-D models made from plastic and wood. FARO Edge Measurement Arm and Laser Line ProbeThis device scans a 3-D image of just about anything and then communicates with other equipment in the Engineering lab to build it. 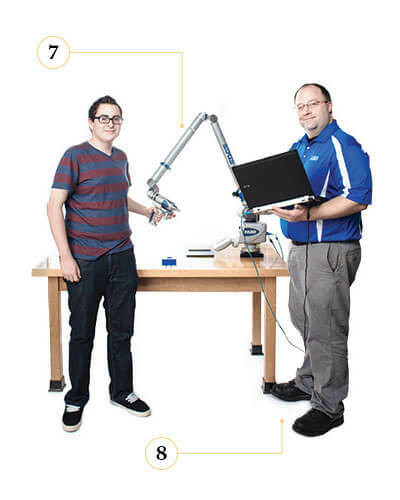 Geomagic Studio and QualifyThis software works hand-in-hand with the FARO arm to get the images to production. 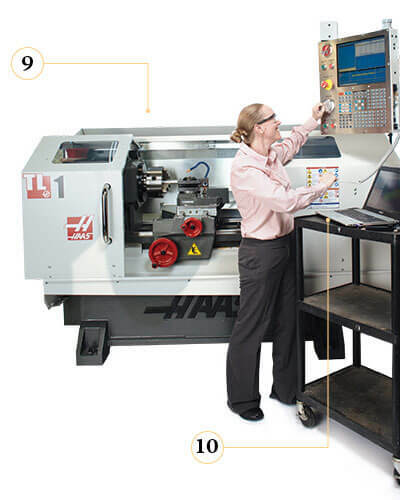 Haas CNC/Manual Toolroom LatheCuts, sands or drills materials — just about any material, including plastic and metal — with exact symmetry and precision. If an Engineering student needs a unique bolt or screw for a project, this can do it. 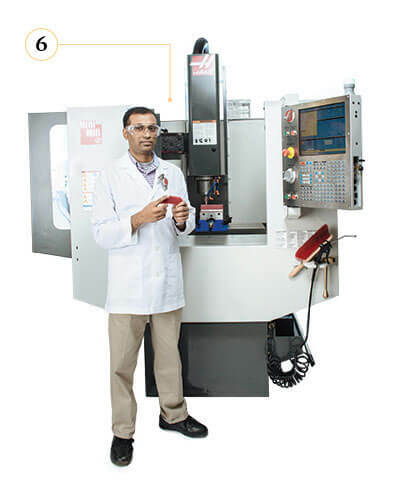 MasterCam for SolidWorksThis is another high-tech software product that designs virtual parts for a variety of apparatus and guides machining tool paths on the CNC devices to create them.